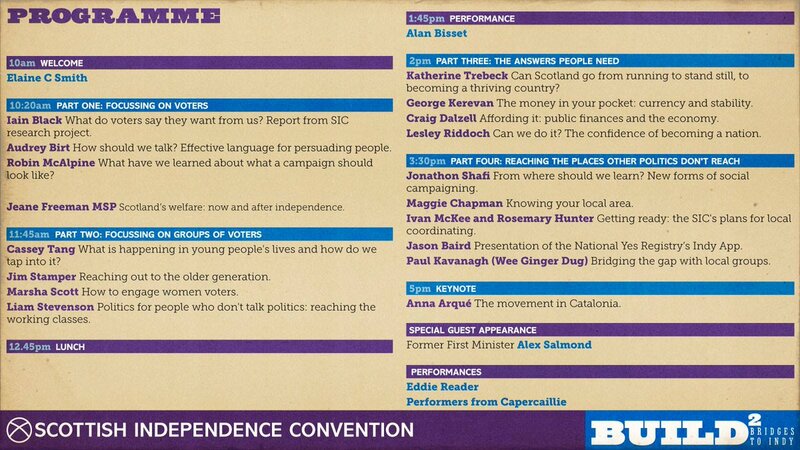 On Saturday 4th November the Build: Bridges to Indy event will be held in Usher Halls in Edinburgh. It is a chance to hear from a huge range of speakers from across the Independence movement who will discuss how we tackle the big questions and how we best organise ourselves to win Scottish Independence. Entertainment will be provided by great acts during the day of the conference. 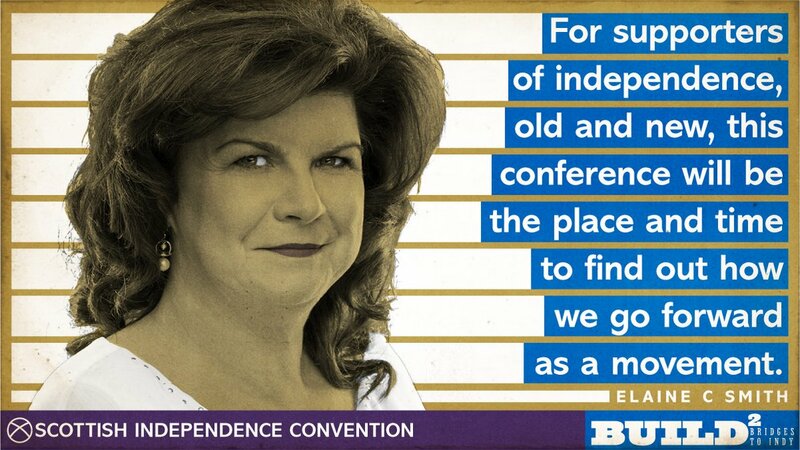 There is something of interest for everyone with a stake in Independence. I’m looking forward to the programme and all the topics are interesting. I’m pleased with the focus on ways to to reach the people who don’t want to talk about politics. In the past canvassing for elections has always focused on “Voter ID” rather than conversion canvassing. This old-fashioned approach is useless for making progress. It seems, however, that those people who have a lot of practical experience in conversion tactics won’t get the chance to share their experience. I’m disappointed that the programme seems to be all centre-stage lecture-style with, inevitably, the same speakers whom we’ve heard so often and who are always to the fore. A few smaller discussion groups might have allowed for new ideas from grass-roots activists who have actually tried different ways of getting the message across to people who don’t do politics. Though I appreciate that the Usher Hall doesn’t lend itself to the sort of event I describe. I thoroughly enjoyed the Usher Hall event in Edinburgh yesterday. Learned a lot, felt inspired, and enjoyed the humour too. Well-balanced and constructed day.